Latham supplies a comprehensive, modern range of resilient rubber dock bumpers for use by carriers, industry and shippers. The dock and boat fenders offer maximum long-lasting protection for loading docks in warehouses, freight terminals, post offices, hotels, supermarkets and other commercial, industrial or institutional buildings with heavy dock traffic. Latham dock bumpers are made from durable, uniform-size, fabric-reinforced rubber pads cut from selected recycled truck tyres and conveyor belting, pressure laminated between heavy structural steel angles and reinforced with 18mm steel tie rods. Unlike moulded rubber or wood-plank bumpers, because of the materials used Latham’s dock fenders are not susceptible to chipping or abrasion. Anchoring through heavy steel plate ensures permanent installation. The fenders are tested to absorb 80% of all impact force, allowing for more flexible loading dock design options and preventing costly dock repairs. 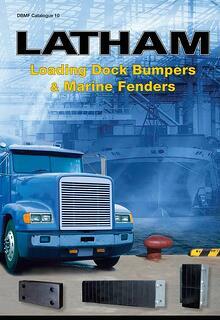 Latham’s fender range is suited to both marine and land based industrial applications. The marine range includes boat dock bumpers and pontoon fenders to protect infrastructure such as docks, wharves, jetties and terminals. Boat bumpers are also available to provide additional protection for the marine vessels themselves. For land based industrial applications, the laminated rubber dock bumpers can be used for projecting above low docks, as rub rails at the sides of truck wells, and as special construction features to accommodate unusual anchoring conditions. They can also be used as wall bumpers to protect against damage from fork-lifts or trucks. The fenders are constructed to be extremely long lasting and provide years of protection. The tough plies of truck tyre and belting virtually eliminate chipping or abrasion unlike other fender materials such as wooden planks or moulded or extruded rubber. The black colouring of the bumpers provides an attractive, professional appearance. Installations can be made of of both vertical and horizontal dock bumper arrangements for complete dock, truck, and cargo protection. The combination of arrangements provides maximum protection and when used in combination with horizontal units, vertical units prevent loaded trucks from prying off the horizontal bumpers as the truck height rises during unloading. Vertical units are also particularly useful when truck leveling devices are in use that raise the entire truck to dock level. Bumpers are available in thicknesses of 115mm, 230mm, or 350mm for situations when door seals are very thick, where there are declined approaches, canopies, overhangs or other architectural features that require greater standout. For trucks with refrigerated doors, one piece bumpers in 115mm thickness can be fabricated to seal the truck to the dock, minimising loss of refrigeration and maintaining maximum protection for dock, truck and dock shelters. Horizontal fenders are available at 900mm lengths, with custom lengths also available. The 500mm, 750mm or 1000mm vertical heights provide extended depth protection for varying truck heights or the lower steel members of trailer bodies. As well as longer lengths for heavy duty dock requirements, moulded or extruded rubber guard pads are also available for light duty areas. Have an enquiry about dock bumpers and marine fenders for your next project?